Below is a letter written by Dr Jonathan Reynolds in response to The Guardian's recent article on water voles returning to Cornwall. It is wonderful to hear that water voles have been reintroduced to Cornwall. Your article was correct in highlighting the necessity of simultaneously controlling American mink – an introduced species which over several decades has eaten its way through our native water vole population. Mink control became a realistic option for conservationists following our invention of the GWCT Mink Raft, which first detects and then traps the mink, leading to very effective and humane control of mink numbers. Through careful research, we showed that this device allows us to turn the clock back, allowing water voles to be re-introduced where they had been lost. 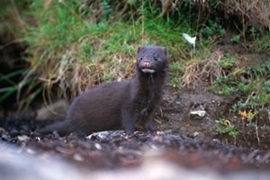 The mink raft now underpins mink control schemes ranging from local to large scale, both in the UK and elsewhere in Europe. Perhaps one day there will be sufficient will to eradicate mink throughout Britain. For the foreseeable future, it is crucial to maintain mink control effort wherever possible, otherwise both existing and newly reintroduced populations of water voles will be lost. Predator control is unpalatable to many, but this is the only way to prevent the ultimate extinction of our native ‘Ratty’. Conservation is not always white and fluffy: sometimes tough decisions have to be made to save the native species that we hold most dear.